Kona Bicycle's Wah Wah 2 Pedals are lightweight yet durable, made of glass-fiber reinforced nylon composite. Featuring a thin, wide platform profile and 14 replaceable pins, these pedals ensure a solid grip from start to finish. 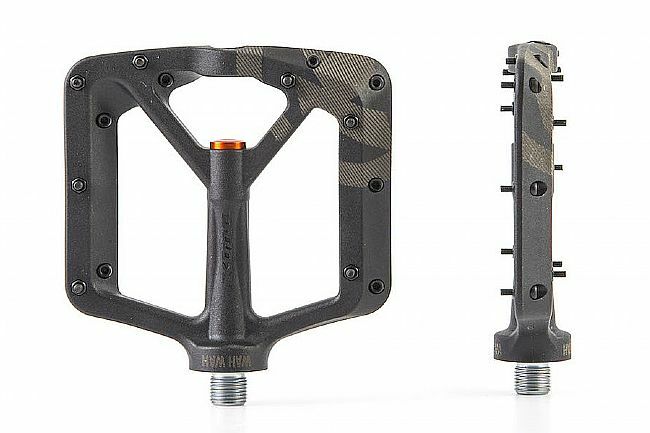 Plus, with a completely serviceable bearing system, the Wah Wah 2 pedals are designed to support your bike adventures and shred sessions for virutally as long as you desire. Light, strong glass-fiber reinforced nylon composite. Platform: 120 (L) x 118 (W) x 13 (H) inches. Pedals are absolutely perfect! I have size 13 feet and they fit beautifully on the pedals. The first time a went out with them, I really put them through their paces. One moment I was smashing them off rocks on techy trails, the next I was hitting fast jump trails and they just held up! Its been two months of hard riding now and they received just minor scratches. Im riding a hard tail and they keep my feet stationary on even the bumpiest of trails. They are incredibly sturdy and solid! Great product! !